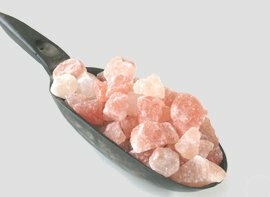 Himalayan Bath Salt Crystals contain 84 essential minerals, more than any other salt, such as magnesium, potassium, bromide, and calcium are readily absorbed into the skin. Naturally harvested from mineral-rich ocean waters that dried and crystallized 250 million years ago. Natural Himalayan salt minerals help the nervous system, relieve stress, can relieve water retention and restore a healthy calcium balance, which strengthens bones and nails. Our salt contains potassium, which you need for your blood after exercise, and which you need for moist, healthy skin and all-over energy. 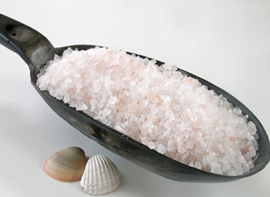 Himalayan salt water bathing also reduces inflammation of the muscles and joints, Bromides in the salt relaxes muscles and relieves pain and soreness. 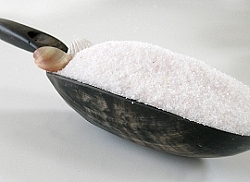 Patients with recurrent infections have turned their health around with regular salt bathing. Himalayan Bath Salt Coarse Grain in cotton drawstring bag. 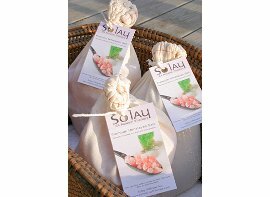 Himalayan Bath Salt Fine Grain in cotton drawstring bag. Himalayan Bath Salt Rocks in cotton drawstring bag.